As an encouragement to families just beginning to explore international adoption, we wanted to share some stories of families who have brought their children home. We had been praying for some time about adopting and were not sure what direction we should pursue. We were researching different options (domestic, different international programs) and felt that God was leading us to adopt a waiting child from China. We kept praying that we would be led to our daughter and KNOW her. It was several months later when I was having a discouraging afternoon, waiting for an agency's waiting child list to be posted. I had about given up for the day when I had a strong feeling to check AAC's website one more time. And when I did, I saw Sarah's sweet baby face slowly appear on the screen in front of me. AAC had just received her file and was downloading it right as I brought up their website. I gasped when I saw Sarah's photo. I KNEW. God spoke to my heart in an amazing, miraculous way that day, and I will never forget that experience. Needless to say, I picked up the phone, called AAC that very minute, and asked if we could review her file. And the rest, as they say, is history. But there were so many other miracles along the way. I have made a special effort to write everything down because all of this is a personal testimony of God's love and faithfulness. HE was involved in every last detail of our adoption. Sometimes I think, "What if?" What if we second guessed what God's plan was for us? What if we decided we just couldn't afford it? Because, frankly, I don't know many people who have $20,000 laying around. We certainly didn't. (And still don't!! ) What if we lost faith and decided that special needs adoption was just too risky? Because, yes, there were times when I was scared. to. death. So many "what ifs"... but we kept praying and praying, and God led us gently by the hand and said, "Yes, you can. You can do this." And. we. did. We have been blessed immeasurably by letting go and trusting in the Lord. And the question is, why can't I do that all the time? Because the lessons God taught me through our adoption experience are HUGE. So I stand in awe, and pray that I may be an instrument in the Lord's hands to do good all around me; to reach out a little more, to serve others more willingly. And these lessons were all part of our journey. Our decision to adopt was an easy one. I had always known I would, I was told I would probably never have biological children. 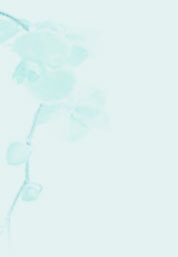 I never considered medical intervention to become pregnant…I wanted to be a mother, not pregnant. However, my husband and I did have a biological son, but the pregnancy turned out to be a difficult one. So, having one healthy biological child was a blessing, but a path to parenthood that my husband and I did not want to risk again. I expressed to Chad that I had always planned on adopting and he thought it sounded like a wonderful idea. His exact words were, “well, let's do that then!”- The decision was made in about a 15 minute discussion. Now, the path to our new family member was unclear. All we knew for certain was that we wanted to work with honest people and adopt a waiting child, younger than our son (he was 4 when we started). We began with one country but changed our minds when things just didn't seam “right”. We looked into domestic adoption through the foster-care system and got nowhere. Then, one day, I had what I refer to as my “adoption break-down”…I couldn't stop crying, couldn't focus on work, we've all been there-right? So, I left work and went home. I knew in my heart that my child was out there and I couldn't find them. I got on my computer and pulled up the “Rainbow kids” web-site (for the 900th time!) There, in the center of the page, I saw these eyes that “spoke” to me. She looked wise beyond her age, which was the same thought I had when I looked at my son for the first time. I opened the window and read the information on this tiny soul named, Wu Ping Wan. A 12 month old baby girl with a “congenital heart defect” who was to be my child and I knew it. I sent an email to Cyndi Peck (who I did not know at the time would end up being the wonderful, caring person that I know today) and told her that we were paper-ready (except for a country change) and could we adopt this little girl? I received an email in return…yes! “Congenital heart defect”…scary words, huh? If you like that, how about “French Five Joint Disease”?! Nobody knows what the heck that is! Turned out to be plain old “Tetralogy of Fallot”….oh yes, that made it crystal clear! We forwarded the information that Cyndi sent us about her condition to some doctor friends of ours, basically wanting to know what this was and could we fix it. In a nutshell, Tetralogy of Fallot is 4 different problems with the heart. A hole between the two chambers of the heart, narrowing of the pulmonary valve, thickening of the wall and an “over-riding aorta (which means the aorta straddles the two chambers). But, more importantly, YES it can be fixed and is actually not that uncommon. So, my husband I discussed it and we decided we could handle this. His exact words were, “well, let's go get her then”-The decision was made in about a 15 minute discussion...yep, Thelma and Louise, that's us. Not even remotely! Me, maybe. Chad, no way!! He's an engineer…it takes him 3 months of research to decide on a cell phone provider. If you don't believe me, ask the wife of an engineer! But she “fit”, she “felt right”, however you want to put it. I mean, what were we talking about after all? What were we afraid of? Imperfection? Don't get me wrong, we were scared and worried and all things you would expect. We researched and questioned…could she die, would she die? One thing was for certain, if no one adopted her, the answer was yes. Think about that…for many of these kids, the answer is yes. We moved ahead, got the paper-work finished and went to China (which we loved) and got our daughter. Honestly, the first few days we were nervous…watching for her to “turn blue” or pass-out. But, we have been home now a few weeks, and she has yet to turn blue or do anything “scary”. In fact, with the exception of us noticing a little “bluing” on an inter-country flight while in China (which were very hot and stuffy) and the fact that her finger and toe nails are a little blue, you wouldn't know there was a thing on earth “wrong” with her. She plays and laughs and gives kisses. Sure, she doesn't have the energy of a healthy 20 month old. She gets out of breath and reaches up for me to hold her for a few minutes. And, sometimes, her condition makes her a little fussy…she feels tired more often than healthy children. Holding her and comforting her takes care of it…no complaints here!! But, honestly, we don't really think much about it on a day-to-day basis. She has no “wires” or “tubes” or monitors, just a heart that needs to be fixed. We have started the testing necessary to move ahead with her surgery and that will be done as quickly as possible. We don't know yet if she will need open-heart (probably, she will) or if it can be done with a scope surgery. Some of the babies that you see with heart conditions on the “Special needs” lists may only require scope surgery-look into it. And, as I said before, she is 20 months old and not the typical 8-10 month old that a lot of people bring home. I can only say, please don't be scared of a child that is a bit older (it cracks me up to think of 20 months old as “old”). First, the “bad” parts of it…she did not instantly come to me when I met her. However, I viewed this as a sign of intelligence-I was a stranger. Also, it can actually be a sign of an attachment disorder if a child her age does go to a stranger instantly. Plus, think how we must look to these babies…big goofy grins, blubbering like idiots, and babbling in some language they have never heard before! However, in less than a day she was attached to me and in less than two days she was gazing into my eyes and reaching up to touch my face and hair. On day three she was playing games with me and smiled for the first time. I honestly know that she liked me before we left China and I know now that she loves me. She took a bit longer to warm up to Chad and she still prefers me…but so did our biological son. It's sometimes just a mommy thing! People often remark what a lucky little girl she is, but we are the lucky ones. We have a precious addition to our family…our baby girl, with a broken heart. Mia is special, there is no doubt. But more and more each day I realize, the “special need” was ours. We have three children by birth, ages 32 -25. When we first married we wanted to have two children and adopt two but the best laid plans of mice and men rarely match reality. WE also had decided they would be special need children. When the youngest was a senior in high school she taught me how to access the internet and when she asked where I wanted to start I replied with adoption as an old friend of ours had been featured on a local TV show traveling to Russia to adopt a 10 yr. old girl with achondroplasia dwarfism like her. A month later we were in the process to bring home a 6 ? yr. old daughter. We had originally looked into a pair of twins whose medicals were extremely risky and regretfully turned their referral down. In the packet of info the agency sent us about them was included our now daughter's biography which was inherently against agency policy of sending the info on unrelated children in the same packet. They did so because dwarfism was one of the Special Needs we were interested in. 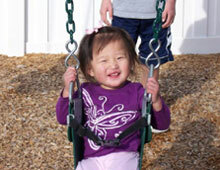 She happens to have a rare form of dwarfism called dyschondrosteosis of which there are maybe 100 known cases in the US. She came home July 5th, 1997. I found out that we were the only ones to show an interest in her. After puberty hit she was diagnosed with bipolar disorder. Six months later we adopted a 15 mo boy from the Siberian region of Russia. He was the second child on a video his agency sent us. They had tried the world over to find him a home, unbeknown to me, but without success. At this point I was 46 yrs. old and reluctant to take on a baby at my age, let alone one with no legs and missing/webbed fingers (the result of a botched abortion) so for six weeks or so I argued successfully against it with myself until one Sunday in church when from the pulpit we heard " We have to respect all forms of life...even those with disabilities." All of us laughed to the chagrin of everyone around us and I made the call the next morning to Nik's agency. He came home December 30th. I left for Russia two days after the birth of my first grandchild and spent Christmas alone in Moscow with my new son. Two years later found us working on bringing a 10 yr. old girl home from China who had achondroplasia, severe scoliosis and kyphosis probably from TB of the spine. We had a doctor from Jon's Hopkins all set to do the needed surgery on her. The process took nearly two years and at the last moment the CCAA said "no" to allowing her out and referred us to a 4 ? yr. old girl who is now having her own growth issues. A couple years later my husband and I had a rare conversation about if we were ever CRAZY enough to DO IT AGAIN it would either be a hearing impaired or visually impaired child from Hong Kong or Haiti. After a voice said "His name is Michael" in church which I thought was someone referring to my future son in law so named, I called my friend who worked for an adoption agency and related the events to her. She gasped. Just that morning she had gotten the papers on a little boy from Hong Kong who was visually impaired and named Mitchell. He is now my youngest. He was a 12 week preemie born dead, with a grade IV brain bleed (worst one). He was VI but ended up not being blind as we were led to believe. He also has mild form of hypospadias, brain stem atrophy, incomplete cleft palate and bilateral kidney reflux which was recently repaired. This past March I was in China bringing home our 7 yr. old who has albinism and is visually impaired as well. So far so good and he is catching on to family life like any normal active 7 yr. old. The process for him seemed to go from seeing his picture to bringing him home without any time in between. Everyone seems to look for the perfect child who fits into the blue-eyed blonde perspective while the SN kids are overlooked. It's been our experience that the SN kids have given us so much for any effort we have put forth for them. Challenges have been bountiful. (Living with a bipolar teen is especially difficult but she is doing well these days and seems to be able to look ahead in life.) The physical challenges of her dwarfism are sometimes difficult to deal with but more so on an emotional basis. Amputated limbs are a non issue. Our son does everything any normally equipped child does with his prosthetics. Of course he has an independent streak we have encouraged which has served him well. Take no pity on him but on what brought him to the circumstances that deprived him of his legs. Our daughter from China is the picture of femininity and every mother's dream daughter, loves to help around the house...my fru fru girl quick with a smile but no memories of her time in China. Our Hong Kong son is proof miracles exist and continues to confound the medical pros. He should be dead, should be blind and profoundly retarded/physically impaired but is none of those. The son with albinism is too new to close the book on but we don't anticipate anything we can't handle. For anyone, especially those considering special needs, READ, READ AND RESEARCH but listen more to your heart and gut than experts. None of our kids would be here otherwise. Pray if so given and have faith. Once home be prepared to social challenges from unexpected sources like unsupportive extended family. (My husband's parent's don't think of the kids as REAL grandchildren). Know you will have to advocate for appropriate education and go armed with info and proof. I was once told I was an ignorant non professional who didn't know what I was talking about because I challenged a principal who said our dwarf daughter was not covered under ADA because she could reach the drinking fountain. I also had to battle with another principal and physical education teacher who expected her and my amputee son to run a mile non stop and jump hurdles. Ignorance abounds. Network with other parents who have children with similar needs. Their, “been there done that expertise will prove invaluable.” The costs are doable and in many cases have been discounted because of their special circumstances. There are as many ways to fund an adoption as there are needs. Sometimes imagination can be an incredible tool. Take care choosing an agency....each seems to have their own requirements as do countries and how those countries' policies are interpreted can vary from agency to agency. Enjoy the roller coaster ride and savor it as deeply as you can. We are a Dutch family with two natural born children. Our son is 12 years old now and our daughter is 9. We already discussed the possibility of adoption in a very early stage of our relationship. Then we started our business and our children were born and grew up. The wish for adoption was still there and we started the procedure. The total procedure took us two years. After having been informed about what to expect and being prepared for all kinds of behaviour of an adopted child, talking to the Child Protection Service and gathering documents, our report was send to China on November 7, 2004. The expectation then, was 14 months to the proposal. In our report we said that we had a preference for an older child, because of the ages of our children. We had no preference for a boy or girl; we just would like to adopt a child. We fantasised a lot about her or him. We would ask ourselves, "what would he/she be doing at this moment?" Then on June 25, 2004 our agency called and told us there was a girl waiting for us in the Social Welfare Institute of Luoyang, Henan Province. She was 3 years and 9 months old at the time. 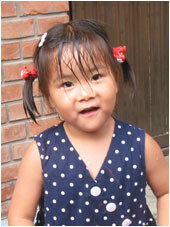 We learned that she was operated on for VSD (heart defect) and was now a very healthy girl. We were so excited. The call came in the morning and we immediately put the answering machine to our business telephone. We called our family and friends to share this fantastic news. The agency expected us to travel in the beginning of September, but we travelled two weeks earlier than expected. On August 14th we arrived in Beijing and the next day we flew to Zhengzhou, where we would meet Xiao Sa. There were two other couples who also would meet their child. We went to the Wei Lai Conifer Hotel to check in and then to the Civil Affairs Bureau. When we entered the Hotel, the children waited for us in the lobby with their nannies. This was very unexpected, but meeting your child is such a special experience anyway. In the hotelroom the nanny stayes for half an hour and then she left. Xiao Sa cried very much, but when we comforted her and played with her, it seemed as if she was at ease in ten minutes. She laughed and started to investigate her suitcase with clothes. She was so well prepared for us, that she accepted us and the situation directly. In China she refused to talk Chinese to people. We were asked if she did speak Chinese, but she just didn't want to anymore. In China we had a wonderful time. Because Xiao Sa accepted us so very quickly, she enjoyed everything we did. We visited the orphanage, which she really didn't like and the place where she was found. It was important to us to collect as much information about her past as we could, so we can tell her when she starts asking. In Luoyang we went to the Notary and received her passport. After a week we went back to Beijing. There our guide took care of legalisation of the notary papers and he collected the visa for her passport. We visited the Great Wall, Tiananmen Square, the Forbidden City and the Temple of Heaven. We really had an impressive voyage and closed this country in our hearts forever. On August 27th we arrived back in Holland. After a fantastic reception at the airport we went home. She accepted the other children immediately. 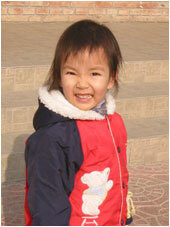 The children also accepted Xiao Sa quickly, they really were a big brother and sister to her. She likes to play with us and them. Our family and friends gave her a warm welcome and she is accepted by everybody. Xiao Sa is learning Dutch very quickly, she can be very happy, angry, sad or demanding. She's just a very normal child that came into our lives in a very special way. Like many people, I was reluctant to consider toddler and older child adoption. However, having the opportunity to visit New Day in the fall of 2003 opened my mind and relieved many of my fears. What I saw was a loving and structured environment. Lots of hugs and soft words. Orderly days, with dependable caregivers that reassured the children that tomorrow could be counted on as surely as today. On May 25th, my joy of being a parent was fulfilled as I walked through the door of New Day to meet my daughter Bethany sitting in the hall waiting for me. All it took was one "Hi Mommy" and I was changed for life. After 20 years as a doctor and a hospital administrator my life is now full of gummy bears, kissing boo-boos, and explaining new rules. Her English is exploding, and although I speak a little Chinese, I use it only to explain things, or for our private "Mommy-Bethany" talks when she needs correction. I believe she could have done very well with an English only family. As everyone who adopts internationally will tell you, the first few days in the hotel are tough, but each day gets better and better, especially as you get into your home routine. Because Bethany had been at New Day for nearly 2 years, she reacted positively to nurturing and structure. Naturally, only time will tell if the attachments and bonding she developed there can transfer to long term attachments to her forever family. However, I believe she has had the best opportunity for that to happen. As in everything, we will trust God for the results. I can never thank New Day enough for investing in this little life, and helping the impossible happen in my life. Three more weeks. Three weeks. I can handle that. Three weeks... I could be ready in two weeks. I could be ready in two DAYS! Speculating is my constant preocupation. Calculating, estimating, wildly guessing how much longer it will be until I hold my new daughter in my arms. Assuming she'll let me hold her. Being almost 2 years old, she may have her own ideas about what should be done with me when we meet! Ask almost any parent who has adopted from China and they'll tell you about the waiting. The guessing. Never knowing how long it will be. You wait for the INS, you wait for the home study, you wait and wait and wait and wait for a referral, you wait for the glorious day that you receive permission to travel to China and bring home your beloved child. Adoption is such a journey, I hardly know where to start when asked about my experience. And we're just at the beginning of the journey! It seems like I've always known I'd adopt a child. Last year when we submitted our application, it simply made "official" the path I knew my life would eventually take. In September when our agency's Waiting Child Program coordinator called to say "I am calling to talk to you about a little girl..." it felt as if I'd been waiting forever. So when people ask me "How long did it take? ", I really have difficulting quantifying that! I can not imagine the adoption process without the internet. It is a tremendous research tool for learning about adoption, agencies, and numerous adoption related resources. It facilitates dossier preparation and other technical aspects of the adoption process. Most importantly, it connects us with other adoptive parents! We ask questions of those who have gone before. We share the joy of those who are a few steps ahead of ourselves. We receive and offer support to others who are waiting. And we encourage each other to keep going, to keep busy, to believe that the wait is almost over! One in ten thousand. One in a million. One in a billion? Guesstimating again. Guessing "What are the chances that we will be able to find out where our daughter's foster home is?" The odds were so very, very slim... but it happened! Through a series of internet connections, I found out that Su Chen was at "New Day Foster Home." I was able to contact New Day by email. Yes, I was actually able to talk to people who take care of my daughter, who see her every day, who have loved her from the beginning! This little person who I don't know yet, this child who is on the other side of the world, seems so "present" to me now. I received a wealth of information about her. First, I found out that the foster home had named her Sophie (meaning "Wisdom"). We'll keep that beautiful name. Sophie. We learned about her health, her personality, even her clothing size. We received photos of her as a baby, and current pictures too. We know that her walking has improved over the past few weeks, and that she is less afraid of strangers now. We know that she has our pictures, and she already calls us Mama and Baba. To have this much information and to have established open communication with our daughter's foster home is incredible. It is beyond my wildest hopes! Most parents have simply the orphanage report and a small outdated referral photo of their child. Our agency did not have any information about Sophie's situation, they were not even sure if she was in foster care or at the Beijing City Children's Welfare Institute. It is not the fault of the agency, they simply have whatever they receive from the orphanage. They don't spend hours every day sleuthing around the internet looking for clues and connections to each child that passes through their files. We are so fortunate, so lucky. It is fate, and it is the result of my constant investigating and searching on the internet. I would encourage anyone who is adoptiong to be very vocal on the internet. I belong to 10 different adoption related internet groups. I spend an hour or more each day reading the messages posted on these groups, asking questions, and answering questions when possible. It is through these connections that I was able to connect to our daughter. One week, one month, one year.... How long will it take for our daughter to bond with us, and we with her? There is a tendency to feel "bonded" instantly when I look at her pictures. But I know real bonding will be a process that may take longer than we hope. Bonding or attachment is the primary subject of many internet discussions and many adoption books. We are reading to feel prepared, but know that no book can predict what will happen when we bring Sophie into our family. While I wait for Sophie, I take care of my 2 year old son, and our home and our family life. Our son is a tremendous joy and quite honestly, I feel nervous about how adding a sibling will impact his life. We have always known that he would have a brother or sister, and we knew we would adopt, and now it is really happening. I feel sad sometimes about the loss of my one-on-one time with Griffin. It has been so special, just me and him, my first experience at being a mommy. I know most parents feel this way when the second child is about to join the nest; I know that most parents also feel overjoyed when the second child arrives, but that it does require some adjustment. Still, anxiety doesn't begin to desribe how I feel at this point in the adoption process. Some days I have mini panic attacks about it all. There are so many unknowns. Adoption is a complete leap of faith. Parenting any child is a leap of faith, but adoption brings specific challenges. On many levels, I am glad that I did not read books about attachment before we started our adoption, because it may have frightened me away. Many of the books are so heavy, so hard hitting. While I agree that some families have very difficult experiences with attachment and other adoption issues, many families really do bond easily and move through life smoothly. Meeting families with adopted kids is one of the best ways to feel like "it can be done." You can get through the paperwork, the waiting, the travel; and most importantly, love happens. The children adapt, you adapt, you can have the family life you dream of. Our agency operates a Chinese cultural center and school, so we had the opportunity to see many Chinese kids running and playing, their parents picking them up from class or participating with them in activities. We were able to meet and talk with many families and our enthusiasm grew. So today when I feel panic creeping in, I focus on remembering all of those happy kids running around and their beaming parents watching with joy. While I continue to wait through these last few intense weeks before Sophie joins our family, I keep busy. I am painting a second hand crib for her. I ordered special bedding for her crib. I am reading "The Weaver's Craft" and other highly recommended adoption books. I am buying clothes for her, packing bags, sorting through boxes in the garage to find baby bottles and other things she might need, putting together a package to donate to the orphanage. And compulsively checking my internet groups. Tomorrow? Monday? Tuesday? One day soon, I'll get the call... that call saying "Pack your bags, you are going to China!" I'll feel like I've won the lottery. I'll call everyone, I'll cry, I'll jump for joy. Our bags will be packed and ready to go. We'll book tickets and we'll know exactly what day we will be in China, exactly what day we will hold our little Sophie for the first time. And then the real journey will begin!